PLANTING METHOD: Best from small stem cuttings. Plant bare rooted or container-grown plants from fall to late winter. 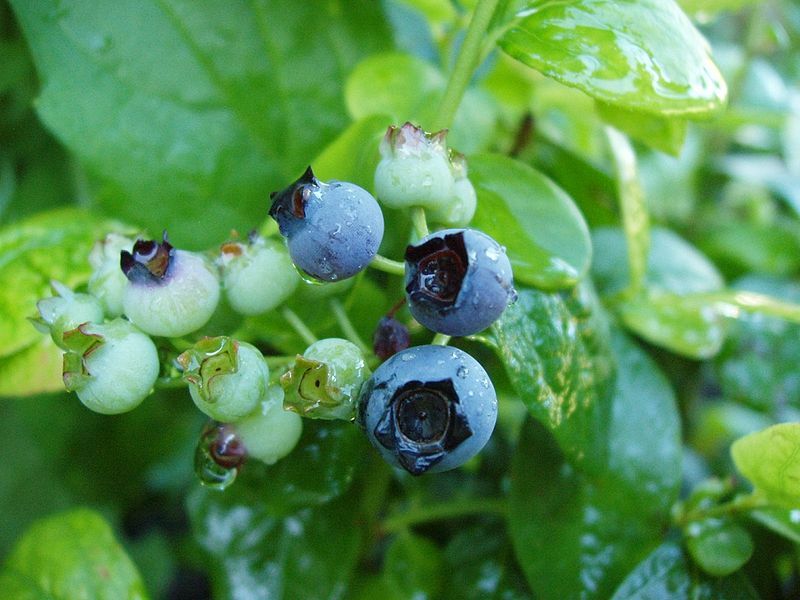 HARVEST TIME: Blueberries start to turn blue weeks before they are ripe. They ripen over a 2-5 week period. Best method - taste some to see if they are ready. Ripe fruit is plump, has a slight softness and will fall off the plant easily. GROWTH HABITS: Bushy deciduous shrubs with white spring flowers and purple berries. They have shallow, fibrous roots similar to azaleas. Plants mature in 7-8 years. CULTURE: Blueberries need acid soils with a pH of no higher than 5.5. They benefit from cross pollination so use at least three varieties in every planting. Use large amounts of compost, peat moss (one of the few times I recommend peat moss), organic fertilizer, lava sand, greensand, and sugar. Cottonseed meal is one of the best fertilizers for blueberries. Mulch on the surface of the soil is critical. Roots drying out will ruin plants quickly. TROUBLES AND SOLUTIONS: No major pests have been identified. Poor soil conditions are the only major problem. HARVEST AND STORAGE: Pick and eat fresh or store in the refrigerator 32-40°. Will keep for about 2 weeks. NOTES: Even organiphobes recommend using organic fertilizers instead of synthetic ones for blueberries. The artificial products can burn plants, especially young ones. One so-called expert says that nitrate-type fertilizers can kill plants. This is the same guy that says not to use barnyard manures because they contain toxic salts. VARIETIES: Tifblue, Woodard, Climax and Briteblue. Q: I planted 3 blueberry plants in May in our backyard. We prepped the soil in the way that the plant guide on the bush instructed us. One of the plants has been a very pale green all summer and has not grown much at all. The second plants has turned a fall purple type color and has grown some. The third plant has done pretty well. It is starting to get a little pale green but actually has grown some and has some tall shoots. I've searched the internet for advise on blueberry plants but haven't been able to find any help. Please give me your opinion on what to do, hopefully they won't die over the winter. Thanks. A: Here are the comments from from commercial grower friend. Get a soil and petiole test. I suspect she's a bit low in iron and magnesium. New shoots she's seeing are a good sign. Once she gets her soil test back, let us know what it says. Make sure the plants are not flush with the ground - in other words planted in a fashion that will give the roots a chance to not sit in water or water to pool around the plant base. If they are, she should consider raising them up once they go dormant. Use 3-4 inches of some compost / tree trimmings over the top of the mounds. Make sure no weeds are within 24 inch diameter around the plants. Begin immediately (if she is not already) watering once per week with Garrett Juice Pro. If they were mine, I'd add twice the recommended amount of Apple Cider Vinegar to the mix to help lower the ph environment around the roots...this may help release some iron and magnesium if it's not available. Put a gallon of this nutrient mix on each plant twice per week, subject to rainfall. Water in between each day as needed. Blueberry plants are different than many others...they must be watered consistently - not necessarily daily - but in a fashion which presents moisture to the roots when they need it - especially when its hot. They really evapotranspirate the water when its hot. Begin immediately foliar feeding twice per week with Garrett Juice Pro per label instructions with a mister of some kind being careful to catch the underside of the leaves and following your guidelines for timing in the early mornings. A: Blueberries will be tough in Cedar Hill. Most of the soil there is black and white with an emphasis on white - limestone. Blueberries don't like alkaline soil. They must have sandy, acid soil to be happy and productive. Making raised beds that are acid is easy enough but the water quality is the other part that needs fixing. Prepare the raised beds or potting soil for containers like Smart Pots by mixing the following at the approximate percentages of soil volume. First of all, forget the peat moss that others will recommend. I think the use of antimicrobial products like peat moss and synthetic salt fertilizers is a primary reason so many people have trouble growing blueberries in less than ideal soil conditions. Instead, start with a base of at least 60% quality compost, then add a 30% blend of rock minerals including equal amounts of lava sand, greensand, expanded shale, decomposed granite and zeolite, and a 10% mixture of coffee grounds, alfalfa meal, and one of the gentle organic fertilizers. Adding a mycorrhizal fungi product to the mix will also be helpful. The potting mixture or bed should be about 14" deep. The water can be improved by filtering and adding apple cider vinegar at the rate of 1-2 tablespoons per gallon of water. Catching rain water and using it exclusively is even better. Add 1 tablespoon Garrett Juice Pro per gallon at least every other watering. For additional acidity, apple cider vinegar can be added at an ounce per gallon of water any time it is needed. Vaccinium fuscatum (black highbush blueberry) and Vaccinium corymbosum (highbush blueberry) are native to Texas. The USDA Plant Profile shows it grows naturally in a few counties in far East Texas where the soil is the perfect sandy, acid makeup. Other selections to try include Rabbiteye, Climax, Brightwell and Triblue. P.S. If you don't want to go to all that trouble, plant some blackberries, pomegranates, figs and jujubes instead. They will do well in normal organic bed preparation and regular tap water. A: I wouldn't even try. Better to spend your time and money on raspberries and blackberries. As you probably know, blueberries need sandy, acid soil for good production.